From a story I wrote at Private Prison Watch, the city of Sherman, TX in Grayson County has been entrenched in an ongoing battle against a proposed for-profit prison and an irresponsible construction scheme for years. Just recently, the city commissioners met again last Monday to discuss a land deal for the new prison -- before even signing a contract with a prison operating company! However, the county remains at a stalemate, as commissioners take the public opposition into consideration. All-in-all, it will cost the county $33 million to contract the construction and maintenance to LaSalle Corrections, when it would only cost $31 million to rennovate and expand the existing Sherman jail. Perhaps cost is not the only issue. Grayson County Judge Drue Bynum, the main figure in the debates who has been responsible for encouraging these plans, said in regards to the proposed plans "we [need] to get ourselves off high-center, and now we are off high-center" ("Private Jail Option Approved by Grayson County Leaders" KTEN, July 13th). In other words, he wants to remove the County's involvement with their prisoners and take the out of sight, out of mind approach. The proposed land siting for the new prison has some Sherman residents upset, and for good reason. The proposed prison site (shown here in red) is directly across Highway 11 from a residential area. With concerns over 24/7 bright lights and noise, one can only speculate as to the upcoming property value decreases. The prison site is only 0.6 miles from the second nearest densely populated residential area, city parks (shown in blue), and within one mile from the Sherman elementary school (shown in pink). 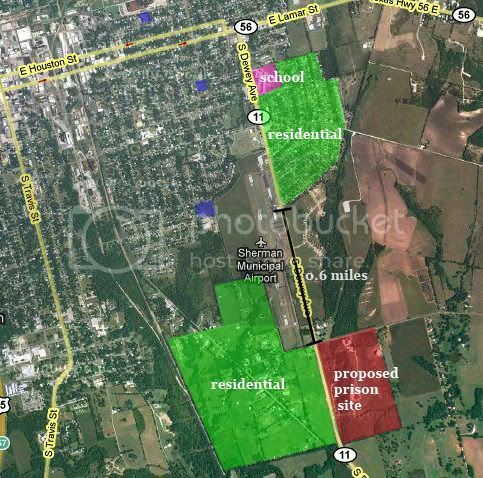 Because of these concerns, a second proposed prison site has been proposed on laned owned by by cotton mammoth Anderson Clayton as a disposal location for decades before today, where it is owned by a Dow Jones board member Christopher Bancroft. This siting would move the prison away from the Southeast into the Northeast, away from the elementary school and residential areas. This proposed siting, however, has not been approved. With the proposed prison to hold 1,500 additional people, there will without a doubt be a sizeable increase in traffic from prisoner visitors, prison employees, legal counselers, and police personnel coming and going at a regular rate. If this new facility is constructed, it will increase Sherman's prison population five fold. Sherman's Mayor, Bill Magers has said, "I understand the concerns of those who live there about having this [prison] near them. I would have the same concerns if I lived there" (Herald Democrat; February 5, 2008). The mayor appears to be the only city official to speak out against moving the Sherman prison out of downtown, stating that it doesn't make to create 1,500 more prison beds when the population of Sherman is 140,388 and the Texas Commission on Jail Standards estimates that about 3 people for every 1,000 are incarcerated -- meaning Sherman only needs about half the amount of the 1,500 prison beds. The opponents and the Sherman mayor are in a standoff against the pricinct commissioners who have plans of importing prisoners from Dallas to make a profit. The startup costs, both in finance and safety are extremely high if this plan follows through, and the potential for profit is minimal. "I think it's time to stop the for-profit, private option and return to the basic concept of expanding the jail downtown," said Sheriff Keith Gary. "[The downtown prison is] near the courts and avoid[s] the pitfalls we have learned exist with a private corporation" ("Private Jail Option Approved by Grayson County Leaders," KTEN, July 13th). There is a great risk that Sherman's jail project will amount to another failed Public Facilities Corporation situation (read about PFCs in Grassroots Leadership's "Considering a Private Jail...?"). So long as Mayor Magers and the citizens of Sherman keep thinking about their own interests and not the interests of private companies, there is a good chance this stalemate will end in the rational choice to remodel instead of reinvent. In a fascinating and disturbing example of what can go wrong when a locality finances a speculative prison, the Fitch ratings agency has downgraded the City of Littlefield's bond rating after the city's GEO-operated Bill Clayton Detention Center lost its contract to hold Idaho prisoners, and has subsequently been dumped by the private prison corporation. Fitch Ratings has downgraded to 'BB' from 'BBB-' the rating on Littlefield, TX's (the city) outstanding $1.3 million combination tax and revenue certificates of obligation (COs), series 1997, and removed the ratings from Rating Watch Negative. The CO's constitute a general obligation of the city, payable from ad valorem taxes limited to $2.50 per $100 taxable assessed valuation (TAV). Additionally, the COs are secured by a pledge of surplus water and sewer revenues. The Rating Outlook is Negative. The downgrade reflects events related to the operation of the city's detention center facility, which accounts for the majority of outstanding debt (which was not rated by Fitch but is on parity with the series 1997 bonds). To the surprise of city officials, Idaho announced their plans to leave the Littlefield facility in January 2009, citing the need to consolidate all of its out-of-state prisoners into a larger facility in Oklahoma. In addition, the detention center's private operator, the Geo Group, unexpectedly announced termination of their agreement to manage the facility effective January 2009. The move to leave Littlefield by the Geo Group is significant, given that the established private operator had made sizable equity investments in the detention center reportedly totaling approximately $2 million. In the past, the ability of the Geo Group to quickly replace prisoners with little disruption in operations, as well as their investment in the Littlefield detention center were cited as credit strengths. The article isn't quite accurate in saying Idaho's decision to remove prisoners from the facility was a surprise. The decision followed the suicide of Idaho prisoner Randall McCullough, who killed himself after the GEO Group held him in solitary confinement for more than as a disciplinary measure. McCullough's death followed the tragic death of Idaho prisoner's Scot Noble Payne a year prior at GEO's Dickens County Correctional Center. After Noble Payne's suicide, a subsequent investigation revealed squalid conditions and the Idaho Department of Corrections Health Director called the GEO prison the worst facility he'd ever seen. On Dec. 9, 2008, Fitch placed the series 1997 bonds on Rating Watch Negative, reflecting the city's active pursuit of various alternatives to remedy the situation and possibly resolve it within the next several months. Funds to repay debt service on detention center COs through August 2010 had been identified through available city funds as well as a debt service reserve fund. The city indicated to Fitch in May 2009 that it was in negotiations with another established jail operator (the operator) to assume management of the Littlefield facility and that the operator was attempting to secure an agreement with a federal agency to house prisoners. Resolution or near resolution of this agreement was expected by August 2009. However, the operator has yet to secure a prisoner agreement and the timing for resolution remains uncertain. I'll be presenting a paper on organizing against family detention and the notorious T. Don Hutto detention center. Texas Prison Bid'ness bloggers Andrew Strong and Nick Hudson will be present. For a complete schedule or to register, visit the Barbara Jordan Institute website or email Byron Price.